Alicia graduated from the University of Bristol Veterinary School in 2011 after completing a Bsc (Hons) degree in veterinary nursing. Alicia is a Clinical Coach which means she is able to support our Student Veterinary nurses and help them with their training. She has also recently been awarded a BSAVA Veterinary Nursing Merit Award in Anaesthesia and Analgesia, and achieved ‘Distinction’ in a ‘Rabbit Awareness Education’ Qualification. 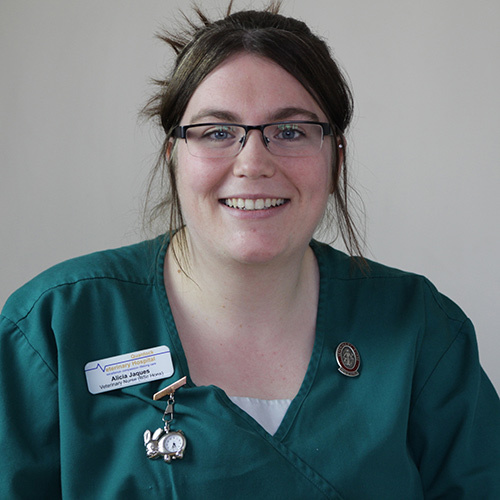 Alicia’s nursing interests include anaesthesia, surgical nursing and rabbit husbandry and welfare. When Alicia is not at work she enjoys going for country walks with her three Labradors Barney, Dino and Chase, and caring for her cat called Bob as well as her six rabbits (Fred, Wilma, Hetti, Barry, Rufus and Belinda).